Who among us hasn’t wished they could take back something they’ve said or done? Nobody is a saint—or rather, nobody can always say or do the right thing in every situation—and even the kindest among us can unintentionally wound another through word or deed. Regret is a fundamental human emotion because it’s one with which nearly everyone can identify, a desire that things were different than they are. For some, the feeling is fleeting, something to acknowledge and then move on from. But for others, it becomes a trap, psychological quicksand of remorse for past actions that continually swallows you up, preventing any ability to transcend or progress past the sticking point of guilt and sorrow. All this time, Mr. Robot felt like a form of therapy for inaction. Fsociety’s revolution, Elliot’s hacks...all of it was a thrilling and emotionally cathartic response to a world that seemed immune to any efforts to improve it. We’re at the mercy of forces far beyond our control, to the point that we’re often scorned even for attempts to imagine transforming it, by people who have so fully made peace with rapacious capitalist structures and ideologies that to challenge such a system is, to them, pathetic—miserably inadequate. The show seemed like a tonic to our need to act. But now, at the close of its third season, it has revealed a secret: Action isn’t always what’s needed. Sometimes, acceptance of what has come before is more revolutionary than all the hacks in the world. It wasn’t just Elliot who needed to make peace with his past, and it wasn’t just the past that needed to be processed and accepted. We, the unseen passenger, are implicated in his present—and it’s the present day that requires atonement, just as surely as the distant past. All the time-travel Easter eggs, the pop-culture allusions to going back and fixing things, every Back To The Future reference (or, in the case of this episode, the scene from Superman: The Movie where he turns back time by flying around the earth counter-rotationally), they all seemed in service of the season-two reveal that Whiterose was building some sort of machine that could change time itself, exactly the goal to which Angela pledged her fealty. But that machine was a red herring, regardless of whether it’s possible, or if Phillip Price is right and it’s merely the result of a delusional obsessive. Because the harm that needed remedying wasn’t a malevolent force out there in the world—it was our actions, since the very first episode, all along. “And with that...you can make it like 5/9 never happened,” Robot tells his counterpart. Who knew that, after all this, Elliot would turn out to be the one who could turn back time? Because that’s ultimately what “shutdown-r” is: The realization of Trenton’s faint hope that everything they did could be undone, that the keys could be used to recover all the E Corp data Fsociety obliterated. And in true Mr. Robot fashion, the one who put it all in place wasn’t Romero, out of some paranoid sense of monitoring the cause he had fallen in with. It was Robot himself, and the reason was the very one he’s been refuting all this time. 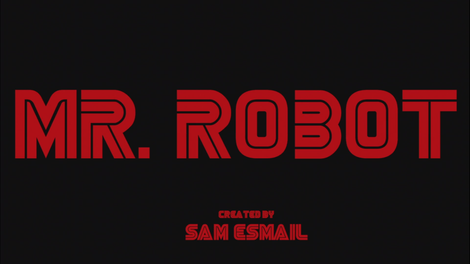 Robot isn’t some evil genius version of Elliot; he is Elliot, albeit a very particular manifestation of him. And as he confesses in the subway platform, he did it because it’s what Elliot would have done. They’re each a part of the other. And Elliot’s fear that part of himself wanted the same thing as Robot turns out to be well-founded—but also not a bad thing. Because ultimately, Robot wouldn’t have blown up those buildings, either. They wouldn’t let each other—and if they can finally become the team Robot wants them to be, they might be able to complement the warring sides of one another. It’s the advice for every character still standing. Dom saw her once-upright ethics crushed under the axe of Irving’s violent threats. Confronted with the promise of bloody terror raining down upon her loved ones, Dom did the only thing she could do: She acquiesced, and lived to fight another day. To her, that was a bridge too far, one that shattered her entire world. Her outburst to Darlene was as understandable as it was misguided: “You are a terrible person...you’ve taken everything from me.” It’s not true, but Dom needs someone to blame, and the manipulative woman standing in front of her is a much simpler target than the nebulous and pluralistic image of the Dark Army and Whiterose. Dom doesn’t yet realize that she hasn’t lost herself, any more than Darlene is at fault. Dangerous people have taken her sense of stability from her, but in living to fight another day, she’s bought herself a chance to win it back. When forces beyond your control wreck your life and force you to give up your ideals, all you can do it find a way to live with what you did; tomorrow can change everything. If anyone takes on the face of the enemy in “shutdown-r,” it’s Irving. The formerly mellow operative lets loose in truly sadistic fashion here, sinking an axe into Santiago’s chest and promoting Dom to the role of FBI mole through sheer intimidation and threat. Whereas before the character was a savvy talker, someone who good-naturedly did what had to be done, here previously unknown wells of rage bubble up to the surface. You can see it in the moments when he turns back to Santiago’s already-dead body, and once more hefts the axe. “These next ones...these are for me.” That anger defines him in a way the character has kept bottled up until now. And when he walks away from everything—possibly to Barbados, who knows?—his sense of justified fury is palpable. “Remember, dollface,” he tells Grant, gripping Whiterose’s latest boytoy by the chin, “I was you years ago.” What’s left of him now isn’t much. Perhaps Grant took that into consideration when he splattered his own brains all over the barn. But the past, to repeat a common refrain in these reviews, is never done with us, because it’s never really past. The memory still operates in the here and now as a force to be reckoned with, affecting our behavior. But our memories are faulty—Elliot’s more so than most, but not by a lot—and so one of the defining moments of his life is revealed to be fool’s gold, a phony narrative that gave his life meaning and drove him to anger and resentment. The story that his father pushed him out the window pushed him forward, but it also pushed him away from who he was, and likely contributed to the fractured psyche with which he’s been at war. Because Robot came to him in the image of his dead father, and that father stood in for the symbolic betrayal of the world against Elliot. He couldn’t have worked with Robot even if their goals were identical. But now that he’s learned the truth, it opens the door for a harmony that couldn’t exist before. Why? Because Elliot found a way to live with what he did, simply by learning what he did. And it was Darlene who gave him that truth, and allowed him to move forward. “I’m here to remember for you,” she says, and that statement could be a motif for their relationship. Elliot inspired her to act, but she inspired him to deal with his past. In season one, it was her shocked realization that he had forgotten who she was that triggered his first confrontation with himself. She pushed him to look into the mirror and see his true life, not the one he had papered over. Darlene keeps him tethered to reality, and more than that, to human connection. Earlier, he had blamed her for his condition, and she planned to leave rather than deal with the consequences of their actions since the hack. But instead, the siblings find themselves in a new place: trust, and forgiveness for the past. More than their actions, they found a way to live with each other. Because that’s the true spirit of Mr. Robot. For all the theorizing and the intrigue, all the reddit threads delving into the significance of a restaurant menu or character name, all the political philosophizing and rabbit holes of mystery, this is a show about the need for human relationships above all else. It’s a grand, messy, passionate plea for placing our trust and care in the people we love, and most of all, finding that love in ourselves when it feels like the world has beaten it out of us. It’s not a particularly hip sentiment, but genuine emotion rarely is. Yes, there’s a mission to come. Yes, Elliot’s right: The one percent of the one percent revealed themselves, and now, he’s going to make them pay. That will be thrilling, and it will be complex. And we’ll still have lots of symbols and portentous allusions and paused screens to study and debate. And yes, we’ll still have regrets, right alongside the characters (of which let’s never forget, we are one). But we’ll also have genuine human connection, embodied in every time Elliot asks us if we’re seeing it, too. And that’s the only real reason to keep coming back. It’s an open question at what point Dom realized Santiago was compromised, but I’m still a little disappointed she wasn’t ready for him in the parking garage, cameras everywhere or not. Nonetheless, I don’t see her remaining broken for long. Ten bucks says she’s teamed up with Elliot before even the halfway point of next season. 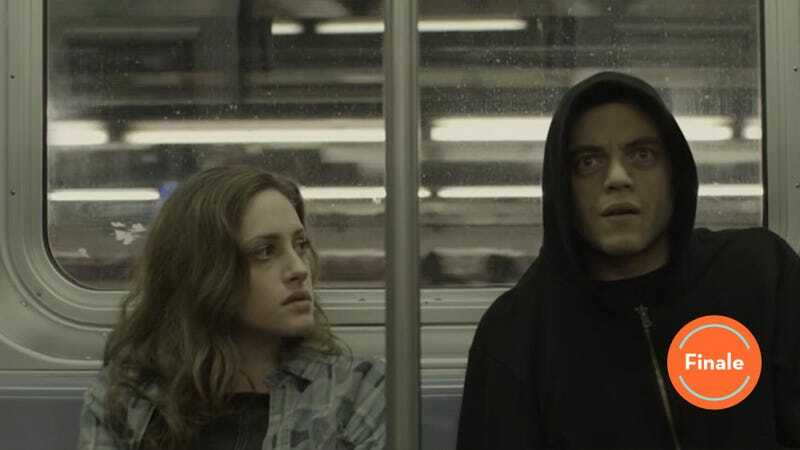 Mr. Robot’s fascination with Elliot and mirrors continues apace, especially the multiple-distorted one after he puts his hand through the popcorn machine at the old Coney Island hideout. Fascinating to hear Price pass judgment on his own actions. “I was cruel to your mother.” It’s almost like he’s an anthropologist, studying human behavior from outside of it. So, Elliot arranges it so that Whiterose’s shipment gets on a humanitarian vessel to Iran. At last, maybe it’s time to start finding out the particulars of that (possibly delusional?) project. Mr. Robot noteworthy music cue of the week: The song playing during the final sequence of Elliot returning home, finding the disc, and initiating the recovery is M83, “Intro,” off the album Hurry Up, We’re Dreaming. Oh no, not Fernando Vera, a.k.a Mr. Brave Traveler. If he’s back in the picture, then sorry, but just allow me to echo Angela Moss: I want retribution for Shayla.